If you are committed to getting in shape, Horizon exercise bikes are an affordable choice for weight loss and weight management. You will get heart healthy and will have made a sound investment in a quality piece of fitness equipment. Horizon is a subsidiary of Johnson Tech that also owns the brands AFG, Matrix, Merit, and Vision. Johnson is the largest equipment manufacturer in Asia, with plants in Shanghai and Taiwan. Better known for value-driven and budget-priced treadmills and ellipticals, Horizon also produces a handful of uprights, recumbents and indoor cycles. Prices range from $449 up to $1099. 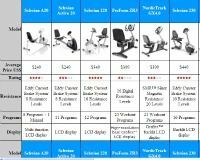 The components used on Horizon exercise bikes are first rate, which is why you’ll have to pay just a bit more for them. As of 2019, it looks like there are only three Horizon exercise bikes left in the lineup, down from about 6 in total previously. The indoor cycle is the commercial-grade Elite IC7, which features a belt drive, 44-lb flywheel, larger display with more workout metrics. It sells for around $829 on sale. 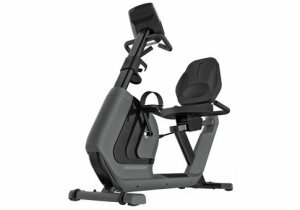 Check out Horizon Exercise Bikes at the Company Store! The recumbent offering is the Comfort R, with a 15.4 lb. flywheel, 10 workout programs, ECB magnetic brakes with 16 resistance levels and CardioCompass heart rate monitoring, at around $719. Horizon's current upright bike offering is the Comfort U, which is similar to the Comfort R but with a wider console, gel seat and cycling hand grips. It's $100 less than the recumbent model at $619. The Elite R7 model was priced at $1029, and added a larger console, 25 workout programs, 20 resistance levels, ViaFit workout tracking capability and Passport interactive technology. The last model in the series is the Elite U7 at $829 which is similar to the Elite R7 except it has the gel seat and a smaller footprint. The M-4 indoor cycle or “spin bike” has a commercial grade frame, triathlon-style handlebars, horizontal and vertical adjustments on the pedal and handlebars, friction brake system, toe clips, and a big 42.5-lb flywheel for ultra smooth performance, all at around $449 on sale. All Horizon exercise bikes feature durable frames, ergonomic design and a high level of adjustability in addition to ample resistance and workout programs. Just as Horizon has made huge upgrades in their treadmill and elliptical lines these past few years, Horizon exercise bikes also score above average in reviews. Horizon focuses on just a few models and doesn’t try to offer a bike at every price point. 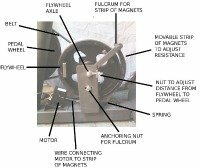 While the number of machines is limited, they strive to produce the best they can, while keeping prices reasonable. They also offer free shipping on every order, financing options and a 30 day money back guarantee...so they are very focused on customer service...something you don't find very often in the fitness equipment industry. Horizon Comfort R - a well-priced recumbent exercise bike with enough workouts and resistance levels to keep you engaged. Horizon Comfort U - the upright version features cycling grips, an adjustable gel seat and 16 resistance levels. Horizon Elite IC7 Indoor Cycle - A highly adjustable bike with a heavy flywheel and smooth, natural motion mimicking an outdoor ride. Horizon Elite U7 Upright - an enhanced version of the Comfort U with workout tracking and more workout programs built in. Horizon M-4 Indoor Cycle - An affordably priced spin bike with a hefty flywheel and a compact frame. Horizon Elite R7 Recumbent - an up-level version of the Comfort R with interactive features and more capabilities. Horizon RC-30 Recumbent - Reviews on this model are some of the best we’ve ever read. It scores well in terms of attractiveness, ease of use, smooth pedaling, quiet operation, variety of programs. See more info on all models and special sale pricing here!